Do you have combination skin? I DO!!!!!!! Ugh – I remember in high school running to the bathroom and grabbing toilet paper so I could pat off my forehead in between periods. Sorry for the visual – but it’s true. I have a very oily t-zone. Then one day – a friend of mine dropped some KNOWLEDGE and changed my world. She whipped out oil absorbing sheets and told me to blot. No more hiding in the bathroom stall right before lunch. Holla! As an adult, nothing has changed. I, of course, have a better makeup / skincare routine. But that doesn’t really lessen the amount of oil my body naturally produces. 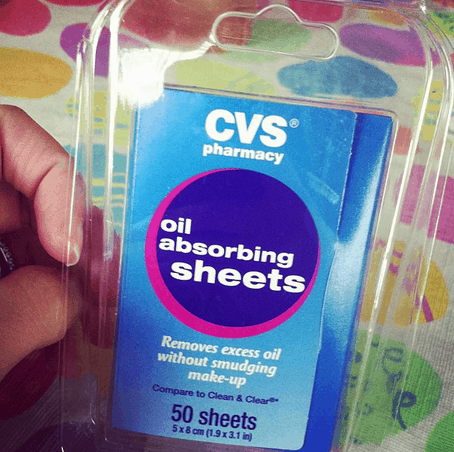 Carry around oil absorbing sheets – like these from CVS – and use them whenever you are looking a little shiny. You don’t have to spend a lot of money for the name brand versions because they all do the same thing. The best part?? They don’t mess up your makeup!!! Yes – you don’t have to worry about ruining your look while blotting because everything stays in place…. except for the oil.